This repo has several jobs which can form the basis of a system supporting a full gating process for continuously deployed container images. They can be used to build or test images which rely on other images using the full power of Zuul’s speculative execution. In order to use these jobs to their full potential, the Zuul site administrator will need to run a simple but dedicated container image registry, and define local versions of the jobs to use it. The following sections describe how to define those jobs and how the system is intended to work once the jobs are defined. A dedicated container registry is required for the use of these jobs. It is merely used to temporarily hold images so that they can be transferred between jobs running in different projects at different times. It does not need to be publicly accessible or particularly robust. If its backing storage fails and needs to be replaced, the only result is that some jobs running in Zuul may fail and may need to be re-run. In this system, it is called the “intermediate registry” to distinguish it from other registry services. You will need to provide the SSL certificate and key values, as well as the htpassword file with a user and password already present. This job is used to provide a temporary “buildset registry” to jobs running in your system; it communicates with the “intermediate” registry described above. The credentials in the secret should match those you supplied when creating the intermediate registry. The requires: docker-image attribute means that whenever this job (or any jobs which inherit from it) run, Zuul will search ahead of the change in the dependency graph to find any jobs which produce docker-images and tell this job about them. This allows the job to pull images from the intermediate registry into the buildset registry. This playbook runs a buildset registry if one isn’t already running. It returns the connection information back to Zuul in a variable called buildset_registry. Other jobs will use that to learn how to connect to the registry, and we can use that here to find out if one was already started in a previous job. We will use that facility in the yoursite-build-docker-image job below. The pause causes the job to wait until all jobs which depend on this one are completed. This job builds one or more docker images and interacts with the buildset and intermediate registries. Note that the parent of this job is yoursite-buildset-registry. This means that a simple repo that only needs to support one image building job and doesn’t have any other jobs which require a buildset registry can just add this job alone and it will run a buildset registry on the build host. More complex scenarios would run the yoursite-buildset-registry job on its own and construct a job graph that depends on it. Because the pre-run playbook in the buildset-registry job only runs a buildset registry if one isn’t already running, it can be used for both cases. And because the run playbook which pauses the job is overridden in this job, this job will not pause. This job further builds on the yoursite-build-docker-image job and additionally uploads the image to Docker Hub. Depending on the situation, you could encode the Docker Hub credentials into this job as a secret, or you could allow other users to provide them via the pass-to-parent feature of secrets. This job does nothing that the promote-docker-image job in this repo doesn’t already do, but since you created local versions of the other two jobs, you should make one of this as well for consistency. If you chose to add Docker Hub credentials to the yoursite-upload-docker-image job, you should do that here as well. Now that those jobs are defined, this section describes how they work together. A buildset is a group of jobs all running on the same change. A buildset registry is a container image registry which is used to store speculatively built images for the use of jobs in a single buildset. It holds the differences between the current state of the world and the future state if the change in question (and all of its dependent changes) were to merge. It must be started by one of the jobs in a buildset, and it ceases to exist once that job is complete. An intermediate registry is a long-running registry that is used to store images created for unmerged changes for use by other unmerged changes. It is not publicly accessible and is intended only to be used by Zuul in order to transfer artifacts from one buildset to another. The intermediate registry is always running and the buildset registry is started by a job running on a change. The “Image Build” and “Deployment Test” jobs are example jobs which might be running on a change. Essentially, these are image producer or consumer jobs respectively. The yoursite-buildset-registry job will run first and automatically start a buildset registry populated with images built from any changes which appear ahead of the current change. It will then return its connection information to Zuul and pause and continue running until the completion of the build and test jobs. The build-image job should inherit from yoursite-build-docker-image, which will ensure that it is automatically configured to use the buildset registry. That will configure the docker daemon on the host to use the buildset registry so that it will use the newly built version of any required images. The second way to use these jobs is in a repository where an image is merely built, but not deployed. In this case, there are no consumers of the buildset registry other than the image build job, and so the registry can be run on the job itself. In this case, you may omit the yoursite-buildset-registry job and run only the yoursite-build-docker-image job. So far we’ve covered the image building process. This system also provides two more jobs that are used in publishing images to Docker Hub. The yoursite-upload-docker-image job does everything the yoursite-build-docker-image job does, but it also uploads the built image to Docker Hub using an automatically-generated and temporary tag. 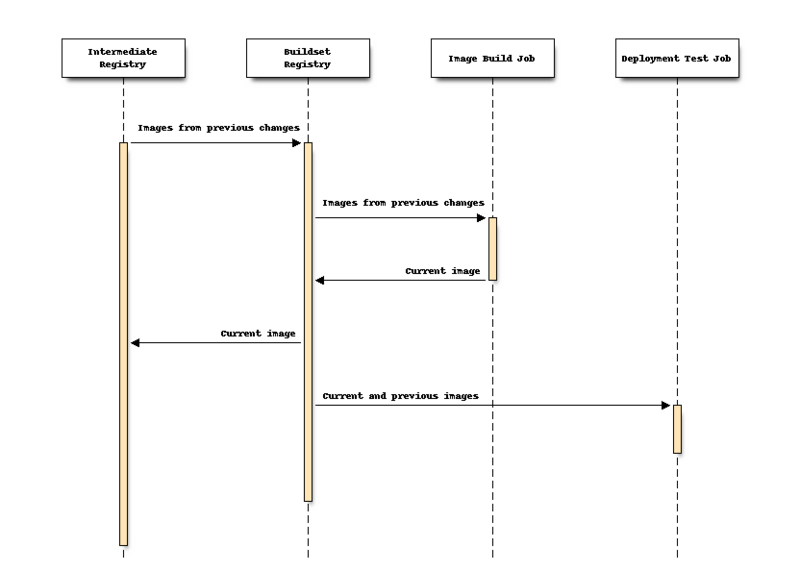 The “build” job is designed to be used in the check pipeline, while the “upload” job is designed to take its place in the gate pipeline. 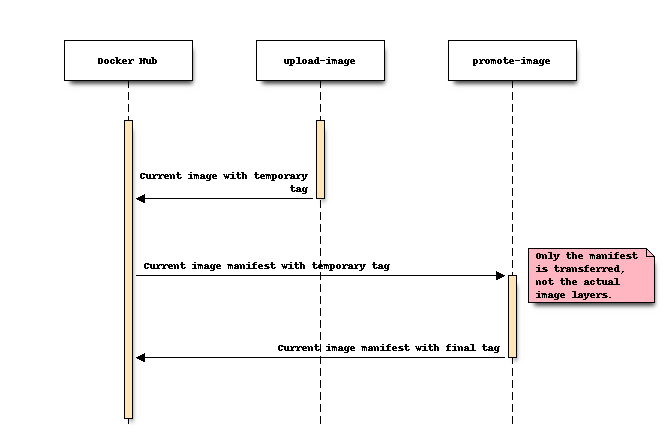 By front-loading the upload to Docker Hub, we reduce the chance that a credential or network error will prevent us from publishing an image after a change lands. The yoursite-promote-docker-image job is designed to be used in the promote pipeline and simply re-tags the image on Docker Hub after the change lands.